The Pink City title does sound clichÃ©d, but the uniform shade of pink colouring the walls continues to enthrall visitors day after day. There are quite a few adjectives that you can render to this city - well planned, beautiful, magnificentâ€¦ And really Sawai Jai Singhâ€™s beautiful foundation lives up to its expectations â€“ in its well-maintained palaces, perfectly planned roads and old-world bazaars with quaint names like Khazanewalon ka Rasta and Johari Bazaar. Shorter distances within the city can be covered by cycle-rickshaws and three-wheelers. Alternately, private taxis and cabs are available for short day trips and excursions. City Palace: Partially occupied by the erstwhile royal family, the City Palace is a simple, yet striking structure defined by courtyards, gateways, mahals and gardens. You would enter the palace through the Atish Pol and move to Mubarak Mahal, which was once a guest house, and now a textile museum. It has on display a wide array of the Maharajaâ€™s costumes, paintings, armours, weapons, elephant saddles and rare manuscripts. The Sileh Khana is located adjacent to the Mubarak Mahal and was once part of the gunijankhana or department of music and dance â€“ today it houses an armoury. Move on through the beautiful marble door into the 2nd courtyard, which houses the Diwan-i-Khas, with intricately carved pillars and arches and flaunting a shade of pink and white. Used for special occasions only, the highlight here are two huge silver water containers which Sawai Madho Singh II filed with Ganga water and carried on his trip abroad â€“ he mistrusted the waters of the west! The Diwan-I-Am or the Hall of Public Audience was used by the king to address public issues and hold public ceremonies. The hall is indeed huge and defined by painted walls, beautiful chandeliers and carved marble pillars. Its highlight features are the miniature paintings, bright durries and carpets and ancient manuscripts. Walk through the Pritam Niwas Chowk, a courtyard where dance performances were held. The Chandra Mahal is the oldest part of the palace and is inhabited by the royal family. Also visit the Govind Devji Temple, located between Chandra Mahal and Badal Mahal, dedicated to Lord Krishna. Prayers and aartis are offered to the God and his consort seven times in a day, and each prayer session reveals the idols in different clothing. Jantar Mantar: A structure of remarkable wonder, this Observatory was built by Sawai Jai Singh II and houses a complex collection of astronomical instruments. This is the largest and the best preserved among the other five built across the country. In fact, so precise was the construction, that you can still observe the time and behaviour of the sun, moon and planets. Albert Hall & Museum: Also called the Central Government Museum, this museum displays a fine collection of crystals, ivory, woodcarvings, jewellery, textiles, potÂ¬tery, sculptures and paintÂ¬ings. The garÂ¬den houses a greenÂ¬house and a herbarium. Hawa Mahal: Undoubtedly the cityâ€™s signature landmark, this red-and-pink sandstone five-storey structure was built to let the royal ladies watch the activities in the bazaars without being seen themselves. Shaped like a crown, the building has over 953 octagonal windows with fine screens, which let the breeze pass through and thus rendered it its name. However, belying all expectations, the building is much smaller inside and the upper floors are accessible only by ramps. 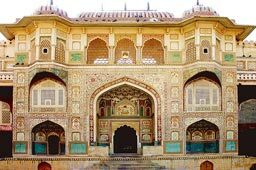 Amber Fort: This was the capital of the Kachhwaha Rajputs and the towering fort is located on a hillock overlooking the Maota Lake. Initially a palace complex, the fort is accessible on foot or by an elephant ride. Particularly interesting within the fort complex is the sandstone Diwan-i-Am, the huge gateway Ganesh Pol, Sukh Niwas, Jai Mahal and Jas Mandir. Also take a tour of the magnificent Sheesh Mahal or Hall of Mirrors, which could be lit by a single candle, because of the tiny intricate mirrors! Close to the entrance is the Shila Devi Temple dedicated to the patron goddess of Jaipur. Also located close to this fort is Jaigarh Fort, which was once the royal treasury. Worth watching here is the Jai Vana, a huge cannon on wheels. Jal Mahal: This palace is located in the middle of the Man Sagar Lake and was built by Madho Singh I to shoot ducks. Havelis: The havelis in Jaipur are one of its most integral parts and are defined by broad arches, balconies with stained glass windows and painted inner chambers. One of the most famous havelis is the Nattani ki Haveli, known for its seven distinctive courtyards. Similar to this, Nawab Saheb ki Haveli offers spectacular views of the city. Equally fascinating is the Rajputana Haveli, which has intricately carved screened windows. Gaitore: Located close to Amber, this complex is known for the chhatris built for Jaipurâ€™s rulers. Particularly noteworthy is the cenotaph built for Sawai Jai Singh â€“ it has carved pillars and stone panels on the domes. Jaipur is not just the capital of Rajasthan; it is possibly also the capital of Rajasthani culinary delights. While there is no end to the usual chains of fast food outlets like Mc Donalds and Pizza Hut, you must sample the most authentic local delicacy of daal-baati-churma, available best at the numerous stalls lining the city. Natraj Hotel on MI Road offers good Rajasthani thalis and Skylark offers a good range on Indian and Thai food. For typically non-vege fares, head out to Copper Chimney, which conjures fine laal maas and safed maas. Similarly, Spice Court serves delectable keema baatis, safed maas and sulas â€“ a non-vegeâ€™s paradise. Vegetarians can head to Annapurna, which has Gujarati thalis, Four Seasons, which has masala dosas and chana bhatura and Garden CafÃ© for its paneer tikka and chana-kulchas. Typically Rajasthani is the well-known Chokhi Dhani, which serves authentic Rajasthani cuisine of gatte-ki-sabzi, ker sangria, bajra roti and mirchi ki chutney, in a rural village-like setting. Also arranged in a similar manner is Sharma Dhaba (try their paneer masala) and Apno Rajasthan (known for its ker sangria and radbi). Surabhi Restaurant on Amber Road serves laal maas and chicken butter masala â€“ it even houses a Turban Museum inside. Sweet-lovers mustnâ€™t leave without sampling and carrying home the local ghevar. Head to the popular LMB (Laxmi Mishthan Bhandar) and Kanji for their snacks of aaloo chaat, tikki chaat and darhi bara, and their wide range of sweets. Rawat Mishthan Bhandar serves mirchi vada and mawa kachori and Bhagat Mishtan Bhandar is known for its laddoos. Donâ€™t miss out on the yummy kulfis, available in a variety of flavours at Pandit Kulfi, and carry home some gajjak mithai from Narayanji Gajjak Wala. Jaipur is most renowned for its lacquer jewellery, tie-n-dye bandhini fabrics and kundan work. The Sireh Deori Bazaar is located opposite Hawa Mahal and is lined with shops selling fabrics, quilts, footwear, jewellery, artifacts and the traditional Rajasthani puppets. Also located closeby are Badi Chaupar and Ramganj Bazaar, known for its shoes, and Tripolia Bazaar, for utensils. For traditional bandhini and Sanganeri fabrics, head to Johari Bazaar, which has a line of showrooms selling these. Also pick up some block-printed fabrics and quilts from here. More clothing can be picked up from Soma, Killol, Suvasa and Ratan Textiles. Johari Bazaar also has a number of shops selling traditional kundan and minakari jewellery. Gopalji ka Raasta and Haldiyon ka Raasta are known for their numerous shops dealing in these. More traditional work can be seen at Amrapali, Gem Palace and Rajmal, from where you must pick up the meenakari-work jewellery. Silver bracelets, earrings, rings and anklets can be bought from Tholiaâ€™s Kuber, Silver Mines and Bhuramal Surana. Especially popular in Jaipur is the blue pottery, available best at Kripal Kumbh and Neerja International. For idols and miniature paintings, Amber Road has a number of painters who would be glad to prepare a piece for you. Marble artifacts are available at Pandey Murti Kala Kendra. Located near Tripolia Bazaar is the Maniharon ka Rasta, where you can watch bangle-makers at work. Kishanpol Bazaar offers wood cots and jute items and Khazane Walon ka Rasta has marble carvings and paintings. Try and visit Jaipur during one or all of its festivals, when the entire city dons a totally different look. Celebrated in March, the Elephant Festival is one of the most prominent festivals here. Held at the Chaugan Ground, the festival begins with a parade of heavily decorated elephants. During the entire course, interesting events, as elephant races, polo matches and tug of war further enhance the celebrations. Live folk performances and Holi celebrations while sitting on elephants are prominent parts of this. Finally watch out for the Best Decorated Elephant contest and get a picture or two of yourself next to the winner! Dedicated to Gauri, a manifestation of Parvati, the Gangaur Festival is another exceptional festival, celebrated by the womenfolk in March for about 2 weeks. The ceremony includes prayers and devotional songs sung for Shiva and Parvati, whose images are made of clay. Unmarried girls carry the traditional matka and ghudlia, which is an earthen pot with a lamp inside, and are later given sweets, ghee and cash by the people. The festival culminates with the images of Gauri carried in a procession, accompanied by traditionally dressed camels, horses, elephants and bullocks. Pots are broken near the tanks, signifying the end of this festival. One of the most interesting festivals is the Kite Festival, celebrated in January. Different shaped kites are flown by everyone in a spirit of competition. Worth watching is the Desert Kite Festival, which takes place every five years, and which showcases various kites created by expert kite makers. Another popular celebration is Teej, celebrated in July. Celebrated mainly by women, Goddess Parvati is worshipped during it for marital bliss. Gifts and sweets are exchanged and women swing on flower-decked rope swings. There is no dearth of hotels here and almost every locality has a heritage-turned-hotel. If you wish to try a budget stay, Jaipur Inn, at Bani Park is a family-run hotel, offering a roof-top restaurant and spacious rooms. Quite popular with tourists, Umaid Mahal, also at Bani Park is a classic style heritage hotel with most exclusive interiors and ambiance. The hotel also boasts of an outdoor dining area, where you can enjoy a puppet show. Located close to the railway station, Hotel Sarang Palace offers 31 rooms and 'Angithi' the roof-top terrace restaurant that serves Chinese, Mughlai, Indian and traditional Rajasthani dishes. Among budget hotels, Hotel Natraj is a 2-star city centre hotel, offering 20 rooms and complimentary breakfast. Prem Abhilasha Guest House is located close to the railway station at Bani Park and is an ideal place for a quiet retreat. Hotel Meru Palace is close to the airport and offers 44 rooms and suites to stay. Definitely a luxury hotel, Trident is located at Amer Fort has 138 rooms, which overlook the Mansagar lake and the picturesque Aravalli ranges. Its in-house Jalmahal restaurant with a pool view serves Indian and Continental cuisine, while the Mansagar Bar and Terrace offers a choicest variety of liquors and wines. Conveniently located on Ajmer Road, the budget hotel Classic Holidays offers 22 well-maintained rooms. Hotel Silver Plaza, a budget property at Subhash Nagar, offers warm hospitality combined with personalized service. Situated 2 kms from the railway station and 20 kms from the airport, this place bears a total of 20 rooms. Hotel Amer View, as the name has, offers views of the Amer Fort and is built in traditional Rajasthani-style. Extremely popular, though on the higher-end is The Oberoi Rajvilas at Goner Road, which is simply luxury itself. Another 5-star hotel, Le Meridien is located at RIICO and offers a variety of exotic rooms, including villas. Located at Sahakar Marg, Hotel Jaipur Palace is a 4-star hotel offering 80 tastefully done-up rooms, a multi-cuisine restaurant and business facilities. Offering world class comforts Royal Orchid Central is located 14 kms from the airport and has a total of 70 rooms. It is an ideal hotel for your business needs. Golden Tulip Jaipur, at Bani Park, has 108 contemporary, Wi-Fi connected rooms with classic touch. It is complemented with a swimming Pool, located at the roof-top, which offers a panoramic view of the Aravalli Hills. Air: Sanganer Airport in Jaipur, is located 14 kms from the city centre and well connected to Delhi, Mumbai and Agra by regular flights. Rail: Jaipur Station is connected to Delhi, Mumbai and Kolkata by regular trains. Road: Jaipur is connected to Delhi via NH8. Luxury and regular buses ply on this route. Alternately, you could hire a car to reach Jaipur.